This week's Torah portion[i] again lists the most horrible curses you could ever imagine. They are so wretched it is truly hard to read them, let alone remember that they have happened to us during our 2000 years of exile. We are told that the curses Moshe first warned us about applied to the exile following the destruction of the First Temple, [ii] and the list in this week's Torah portion apply to the exile from the Second Temple which is the exile we are still experiencing today. One major addition in this listing from the previous time Moshe listed curses is this time he tells us specifically why those miserable curses come. It does not say that these curses came because we did not serve G-d. It says that these curses came because we did not serve G-d with joy! 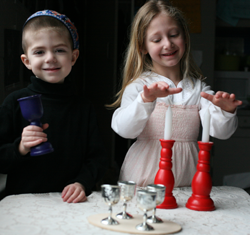 This is how important it is to be happy when you do a mitzvah. When we serve our Creator joyfully it gives Him joy. If we rob Him of His joy He will, G-d forbid, take away our joy! When we do a mitzvah we say the blessing, "Blessed art Thou O'L-ord our G-d Who has made us holy with His commandments…" Fulfilling His commandments makes us holy. Can there be any better reason than this to be happy? Think of this whenever you do a mitzvah.